Do you have an intricate and challenging component to deliver? Smiths have the expertise, internal processes and experience developed over the last four decades to help you find a perfect solution. to gain real life experience and engineering knowledge with The Smiths Apprentice Scheme. of hard metal, precision engineering, on time, every time. We like a challenge. With the in house expertise of our engineers and highly skilled and trained staff on our workshop floor we are confident that we can rise to any challenge our capabilities allow us to. Our expertise has seen us solve complex component challenges for many different markets over the course of our history. Aerospace is Smiths’ core industry, it is where we grew our roots. We have delivered high quality, complex components for the industry for over four decades. Smiths work with companies requiring complex hard metal machining in the Marine sector. Shroud Front Platform Leap1B. Fits on the front of the engine behind the spinner. Elbow Pipe Fitting used on Rolls Royce Trent 900 engines. This is a Ring Seal used on a Boeing LEAP engine. The blue areas are hard coating, used for sealing compartments within the engine. 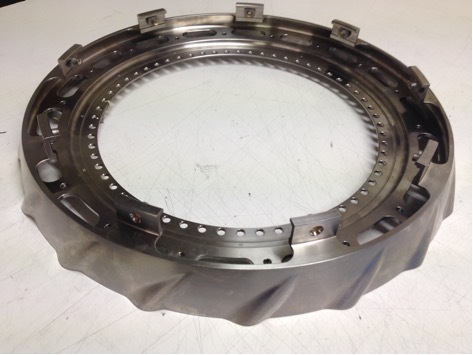 High Pressure Turbine Casing (HPT Casing) Used on the Silvercrest Engine. IGV Ring used on one of the Rolls Royce This ring is produced in two layers, in use, finishes up as one ring assembled together.